From @teamwaxman in STAT: pharma waste and antibiotic resistance – microBEnet: the microbiology of the Built Environment network. From STAT article. 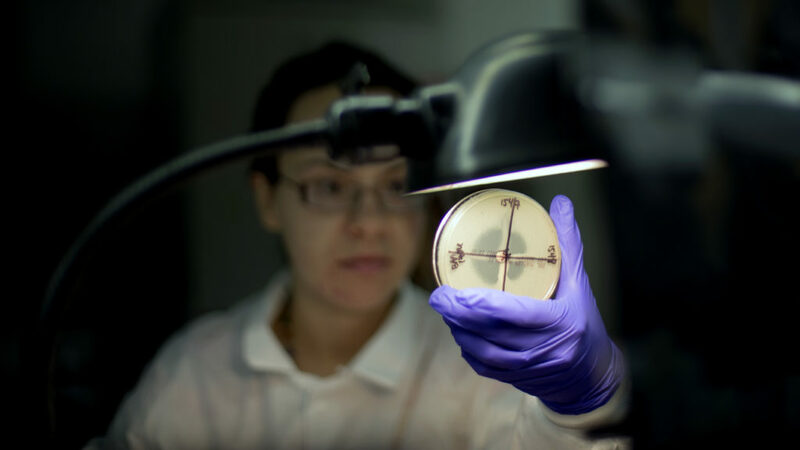 Original caption “Microbiologist Tatiana Travis reads a plate to check on a bacterium’s resistance to a carbapenem antibiotic at the Infectious Disease Laboratory at the CDC in Atlanta.” By DAVID GOLDMAN/AP. Waste released from pharmaceutical plants in India and China is contributing to the spread of antibiotic-resistant superbugs. So this is certainly interesting. There is an opinion piece in STAT by Henry Waxman and Bill Corr from Waxman Strategies: Waste from pharmaceutical plants promotes antibiotic-resistant superbugs. It is of interest both because we are almost certainly in need of more efforts to control the spread of antibiotic resistance and also because of who wrote it. Waxman was in the US House of Representatives for many many many years and Corr was deputy secretary of Health and Human Services from 2009 to 2015. So it is good they are emphasizing this. Though I am not completely convinced by the references in here that we know a lot about how / if waste from pharma plants impact resistance. Again, not sure about the degree of evidence at this point for a connection between pharma waste and resistance. Regardless, it makes sense that this is a simple action we can take with a likely benefit.